I developed a program named "The Chair Challenge", for myself as well as for other people who are looking to share a harmonious connection with horses. Hanging out with horses and becoming a part of their world was more beneficial to my life than any horsemanship instruction I have ever received. As far as instruction goes, the most beneficial coaching I have ever received was from my Dad. My Dad kept me focused on the rapport and connection that I needed to have with a horse before I asked the horse to do anything. Today I call this the "entry point of connection". He taught me that first you have to be able to make a connection in the moment; doing nothing, before you ask a horse to do something. It is quite simple to do, but so easy to forget. When a horse is willing to share a moment in the pause with you, before you can ask him to do anything, the interactions that follow will happen in a natural and spontaneous dance. Another important requirement for easy, productive interaction with your horse is that they easily move forward when asked to. 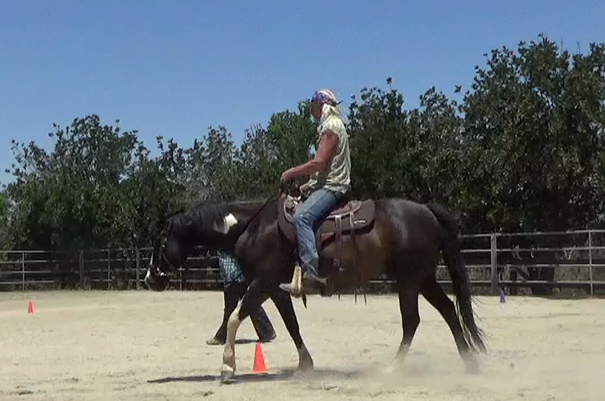 One of the focuses of the Chair Challenge is showing you how to put a great “gas pedal” on your horse in a relaxed, easy step by step process. My Dad also told me that it’s important to find a certain quality in the connection that you share with your horse that will rise out of the moments you share in the pause. This magnetic connection will bring you and your horse a sense of trust, respect and well-being. When this quality is present while you are riding your horse whatever you do together is experienced in harmony; you and your horse become one. He could not explain what that felt like but when it happened for me I knew what he was talking about. When it happens for you it will be the same. It is a very powerful pause. Sitting in halt waiting for a horse to feel a sense of oneness is the key. A couple of weeks ago I was giving a riding lesson to Jerry on his horse Scotty. Scotty is a green horse that is just able to be ridden in walk and trot. He is a very athletic horse. Jerry and Scotty have a great relationship and a growing rapport from lots of time shared in the pause from the ground to the saddle. I have only given him a handful of lessons. There have been a lot of days between the lessons and each time Scotty surprises us with more advanced skill under saddle. Scotty and Jerry have evolved very quickly and I contribute it to the partnership Jerry has with his horse, and also Jerry learning the importance of this pause, from his lessons with me and his practice in The Chair Challenge. In the last lesson that I gave Jerry we stayed for some time in the pause as usual. Jerry was sitting on the back of his horse in a deeper, more meaningful connection than usual. Scotty looked like he was ready to respond to anything Jerry would ask of him. I could feel that magnetic connection they were sharing together. I asked Jerry to canter his horse down the center of the arena and halt, turn around and canter back halting again and repeat. They did this without even warming up from a complete stand still. Scotty stepped into canter, as pretty as you please, and cantered down to the end of the arena and stopped. Then, Jerry turned him around and cantered his horse back. When I started coaching Jerry, Scotty did not want to stop when asked. Before he began his lessons with me, Jerry had not done enough pausing in halt while riding Scotty. Today Scotty has a cute, collected, energetic jog trot. His over all carriage is beautiful without any influence from Jerry. He moves easily from the slow walk to a medium walk to an extended walk as if he had been trained previously to do it. My focus in training Scotty is waiting for the connection to bloom out of the pause. None of this would have been possible with Scotty if it was not for us paying attention to the practice of sharing a connection while doing nothing together in harmony, so that when you do something together, magic is the outcome. Jerry has spent more of his training time with Scotty doing The Chair Challenge than riding him under saddle. Jerry has only ridden with me less than a dozen times. In just a short time they have become a flawless pair. Here is a tip - When you lose your rapport with your horse under saddle, halt your horse and wait for the rapport to return. Don't go back to what caused you to lose your horses willingness. When the rapport returns ask your horse to do something that will continue the connection you had with him. Rapport needs to be present in communicating and training horses. A secret to developing a horse under saddle is to have no expectations based on what he did the day before. Knowing what to ask and when to ask it, and paying close attention to the entry point of connection is key. I would love to hear about the rapport and connection you share with your horse and how you got there. You can level a comment below. This is a great platform to share our personal insight with one another. There have been so many changes in the horse world since I have been writing my blog over the past years. It is more than I could have ever dreamed possible. You and I are making the difference. One thing for sure is that the equestrian world is opening their eyes to the needs of horses more and more each day. It comes from all of your support to bring the next generations to grow to a higher level of responsibility for the care, custody and control of horses. Thank you for supporting my free blogs for so many years. You subscriptions and sharing them gives me the interest to keep writing them for you! Be on the lookout for new horse and human sightings. May the spirit of the horse be with you.